Embroidery is the process of sewing artwork or logos on to apparel and accessories. IT ALL STARTS WITH YOU ! Your artwork (See our submission guidelines for art) or design concept is sent to our in-house art department, where one of our talented artists will prepare it for digitizing. If you have a clean copy of an existing logo, this step may not be necessary. Once your artwork or logo is finalized, it needs to be digitized before we can proceed with the embroidery process. This one time process involves using specialized software to convert your artwork or logo into stitches. Before sewing can begin, chosen thread colors must be loaded by hand into the machine. A spool of thread for each color in the design must be loaded into each sewing head. The machine is then programmed with the digitized logo file. 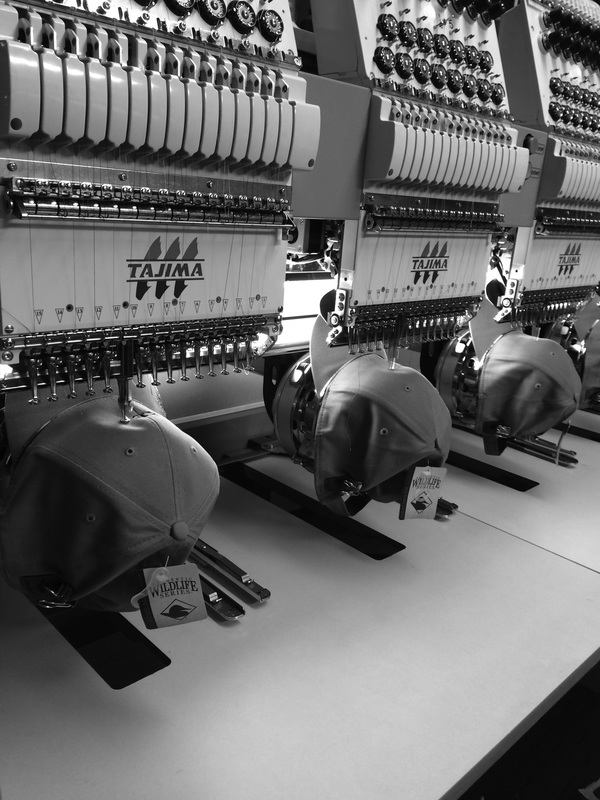 Garments to be embroidered must be hooped individually and loaded on to the machine. The machine is then started and the digitized program will sew your logo on to the garments. Once the design has been sewn, each garment is removed from the machine, un-hooped and sent for finishing. All garments are inspected individually for quality and trimmed of excess backing material and thread. If the garment gets additional embroidery, the process is repeated.